Whether you’ve got a spare set of tires for the snow or a set for the track, anyone who’s passionate about our cars is looking for a better way to store tires in the garage. No matter what you use your spare set of tires for, you want a good place to store them and get them up off the ground and out of the way. 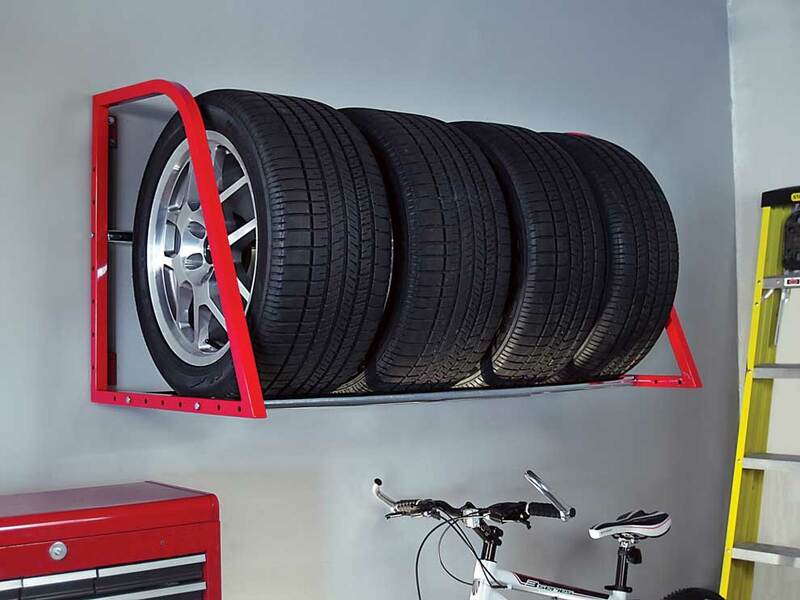 How do you store tires in the garage? Whether mounted or unmounted, tires should be stored vertically, not stacked on top of each other. Tires should be away from any machinery or electrical components in as climate controlled and airtight an environment as possible. There are a couple of different options to store your spare set of tires and still keep your garage looking great. Choosing the right way to store your tires will help them last longer and perform better once you put them back on your car. Vertical: You should always store your tires vertically and never stacked on top of each other. Rubber is softer than a metal rack, a wooden stand or your concrete floor. If left in one place long enough, tires will develop flat spots. Flat-spotting on the tread isn’t usually a big deal. You’ll normally have a bumpy first couple of miles when you start driving it again, but it’ll even out fairly quickly. But, if you store unmounted tires on their sides, stacked on top of each other, the sidewall will begin to buckle under its own weight. In the worst cases, you may not even be able to re-mount the tire again. Always inside: The sun’s ultraviolet rays (not to mention the blistering heat) quickly break down. The temperature of a tire sitting in the sun can easily reach 135 degrees Fahrenheit, which will shorten your tire’s lifespan. A climate controlled garage or storage area is best, but anywhere indoors is better than sitting unprotected and exposed to the elements. Keep them cool: Speaking of a climate controlled area, you should always keep your tires as cool as possible, but never anywhere it can freeze. Rubber expands and contracts with changes in temperature. Each time it goes through that expand\contract cycle, there are chances that small cracks will form and break down the integrity of the tire. If the tires see regular use, the oils in the rubber will disperse and help prevent any damage. If the tires are sitting in the same place, they never get the chance. …and dry: Ideally you’ll store tires in an airtight bag, but that’s not always practical. You don’t want anything that we keep on a shelf in the garage to spill on your tires (motor oil, antifreeze, fertilizer, paint, etc.). Keep them clean: This just makes sense, right? Before you put your winter tires away for the spring, you’ll want to clean off any salt or road grime that’s accumulated. Use a gentle soap and water solution only, not any tire shine or other dressings. More on that later on. Never store your tires outside: The sun and heat will quickly break down the rubber in the tire, shortening its lifespan. Never use tire dressings before storing your tires: You should never use a petroleum-based dressing on your tires, even the ones on your car. Petroleum helps to break down the natural protectants in the rubber and shorten their lifespan. Many companies have moved away from petroleum in their products. But if you’re storing your tires for any length of time, a simple soap and water cleaning is all you need. Never store tires near electric motors (including air filters): Pretty much everything has an electric motor of some sort, and many of them produce ozone as a byproduct. Air filters and ionizing air purifiers are some of the biggest culprits. Not only is ozone a lung irritant, but it will also break down the rubber in your tires. Keep your tires as far away from electric motors as possible. Never stack your tires on top of each other: The rubber in your tires will start to flatten out under any kind of weight – even when you’re sitting in the parking lot. The longer the tires stay in one place, the more this happens. When you stack tires on top of each other, the weight will start to compress the wall of the tire. If left too long, you may not be able to mount the tire, turning your $200 tire into an oversized chew-toy for your dog. If you’re storing tires that are already mounted on wheels, there are a couple of additional things to keep in mind. Always keep a minimum of 10 psi in your tires when storing them on rims. There needs to be a higher pressure inside the tire than in the outside air in order to keep the seal intact. Anything less than 10 psi and you run the chance of having that seal break down and develop a slow leak. You can mount wheels and tires on the wall (it looks really cool), but only for short term use. Track tires are the only time I can see this working well. Anytime you’re storing your tires for long term (winter\summer tires), they should be protected from the elements. When cleaning the tires that final time before storage, take the time to clean the wheel as well. Use whatever cleaner works for your wheel’s finish, but be careful not to get any on the tires themselves. If you do slip up, wipe it off with regular soap and water. How long can you store tires in the garage? Like anything else, tires have a life span. Even storing your tires correctly, they will eventually break down and become unsafe to put back on your car. Tires have a theoretical lifespan of around ten years when stored in perfect conditions – climate controlled, dark, vacuum sealed bags. For those of us that don’t live in a lab environment, six years is more realistic. Do tires give off toxic fumes? The creation of rubber does involve dozens of toxic chemicals (including carbon disulphide). Oddly enough, there have been no significant studies since 1988 on exposure to fumes from rubber. That study (link to CDC.gov) did find an increase in heart disease, but couldn’t directly link it to exposure to fumes. 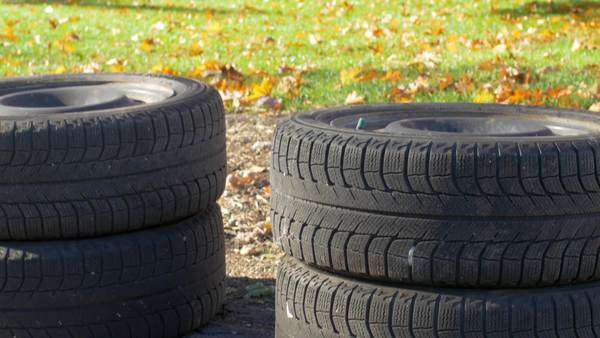 How do you keep tires from dry rotting? Dry-rotting is caused when the rubber compound starts to degrade. The best way to keep tires from dry-rotting is to keep them in an air-tight plastic bag and out of the sun’s harmful UV rays. I’ve said a couple of times before, but it’s worth repeating here: never use petroleum based tire dressings before you store your tires.